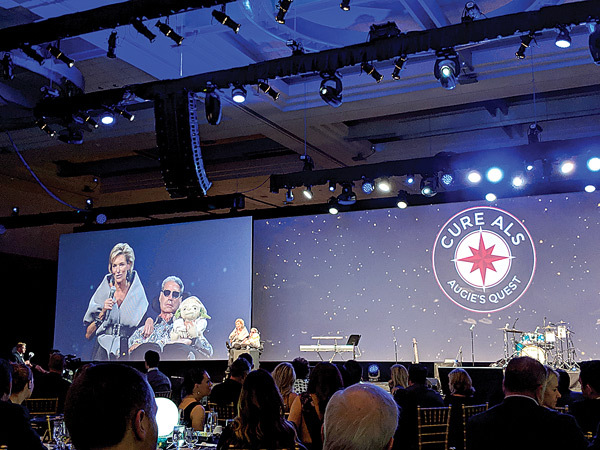 SAN DIEGO, CA - On the evening of March 15, Augie's Quest to Cure ALS held its 14th annual BASH, a celebration of research advancements for ALS, or Lou Gehrig's disease. Coinciding with the annual International Health, Racquet and Sportsclub Association's (IHRSA) International Tradeshow and Convention, the BASH represents an opportunity for the fitness industry to celebrate advancements in ALS research and reinforce the critical importance their generous giving offers to those affected by this disease. 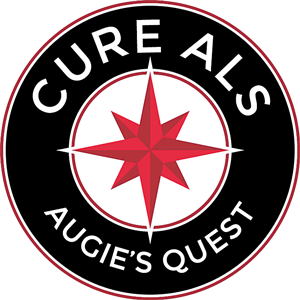 Because the health of our bodies is such a personal matter for the industry, thousands of fitness clubs across the country have contributed to the fight against ALS alongside Augie's Quest to date. Hosted by International Zumba Education Specialist, Loretta Bates, and featuring entertainment from world-renowned vocalist Sheléa and America's Got Talent comedian Preacher Lawson, the evening raised close to $1.9 million for the organization's efforts to fast-track effective treatments and an ultimate cure for ALS. Augie Nieto, Founder of Augie's Quest to Cure ALS, and a fitness industry business icon who himself was diagnosed with ALS in 2005, noted, "Our partners and donors from across the fitness industry are one in a million. Their competitive spirit, significant financial support and fierce commitment as a collective industry to actively champion the health of so many people affected by ALS is driving real change and research results." 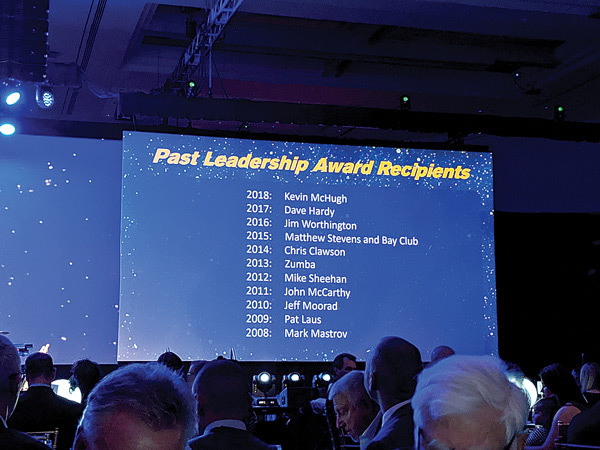 During the event, Joe Moore, IHRSA President and CEO, was awarded with the 2019 Augie's Quest Leadership Award. 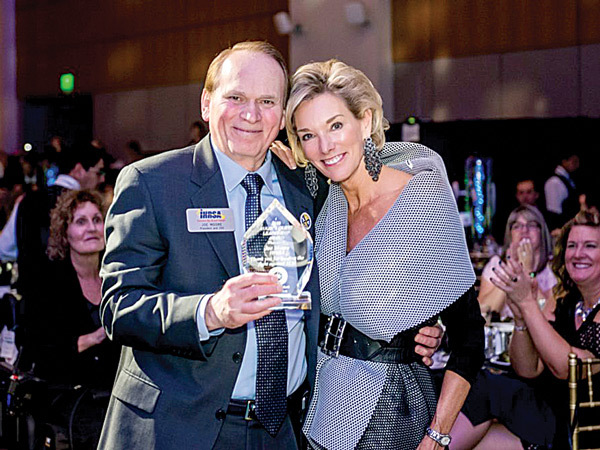 Moore commented to Club Insider, "It was both a surprise and honor that, during the BASH, I received the 2019 Augie's Quest Leadership Award, but the real story is that the industry came through again, raising over $1.9 million for ALS research! The BASH was better than ever; it seemed to flow seamlessly. The dinner was excellent, the fundraising struck the right note, the musicians rocked, and the dancing was fun to watch." Prior to the event, Fernando Vieira, M.D., the Chief Scientific Officer at the ALS Therapy Development Institute, spent time with area Southern California families recently diagnosed with ALS. Vieira provided insights on the role the fitness industry has played in the way scientists are tackling ALS today, particularly through ALS TDI's innovative Precision Medicine Program that tracks ALS progression on a patient-by-patient basis.